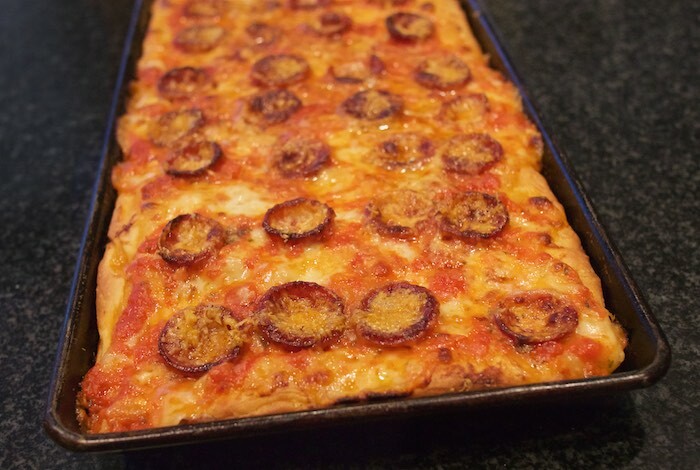 I grew up in an Italian/American household where eating Sicilian style pizza was something we did often. Whether it was homemade or bought from the local pizzeria this Sicilian style pie I am referring to was always square and slightly thicker than the more traditional round pies. Not quite a deep dish and definitely not a thin crust, the Sicilian pizza seems to be its own distinct style of pie. My mom would spread her pizza dough into a baking sheet, top it with either olive oil and anchovies or tomato sauce and mozzarella; depending on if we wanted a red or white pie. The thick crust, square pie baked up crispy on the bottom and light and chewy on the inside. It was dense yet light all at the same time. It's been awhile since I've had a good Sicilian pie so when I saw the recipe below on Seriouseats.com I had to give it a try. Let's just say this pie reminds me of being a kid in Philadelphia a time when Sicilian pies of all sorts were much easier to come by then they are today. Combine flour, salt, yeast, 0.35 ounce olive oil, and water in the bowl of a food processor fitted with the blade or dough blade attachment. Process until a dough that rides around the blade forms, then continue processing for 30 seconds. Heat olive oil in a large saucepan over medium heat until shimmering. Add garlic, oregano, and red pepper flakes and cook, stirring, until softened and aromatic, about 1 minute. Add tomatoes. Using a pastry cutter or a potato masher, break up tomatoes into fine chunks. Stir in sugar. Bring to a bare simmer and allow to cook for about 15 minutes to let flavors meld. Season to taste with salt. Set aside and allow to cool slightly. Spread mozzarella cheese evenly over surface of pizza. Spoon sauce on top of cheese spreading with the back of a spoon. Only put as much sauce as you desire. Place pepperoni slices evenly over surface. Sprinkle with half of Romano cheese. Transfer to oven and bake until pepperoni is crisp and curled and bottom of pizza is golden brown when you peek by lifting the corner with a thin spatula, about 10 minutes. I definitely want to be a part of your household when you make this :) This looks amazing Theresa! Ooh, now I'm craving pizza. This looks delicious and would definitely be a hit with my family. This recipe looks great! My whole family would enjoy this pizza. I will be making this for dinner soon. Love the tips and techniques for baking the pizza! It looks and sounds so wonderful! I really like your sauce. We usually make our own pizza dough, roll it out onto 4 half sheet pans. (We are a big family and love leftovers, too) I just watched the Good Eats episode where Alton shows how to make the best pizza dough. I want to try to condition the dough the way Alton did. My favorite topping on pizza is basil and jalapeno peppers. This oven has me dying!!! I want good pizza again. I love broccoli and mushrooms on my pizza. I love ham and pineapple on my pizza! Thank you for the wonderful giveaway. This looks SO good!! It's the kind of pizza, I remember from my travels in Italy! I love that you do pizza nights and THIS pizza looks amazing! I love Sicilian style pizza...something about it is just so yummy and comforting! Yum! We do pizza nights at our house too, and this looks so delicious! My favorite pizza topping is mushrooms! Pepperoni is my favorite pizza topping!